After doing two consecutive articles about the aging bookseller, perhaps it won't be such a concession for me to admit that, when I was in high school, Barbra Streisand was just getting traction with her acting/singing career. I know - the 1960's! I mention this because during that period one of my sisters brought two of her college roommates home for weekends now and again. Both lived many states away from campus, and this was a welcome event for them, sort of felt like going home. 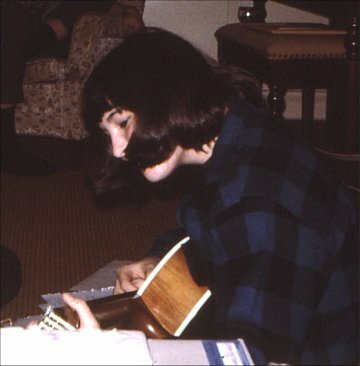 Dottie loved Barbra Streisand, and she had had the distinct privilege, she told us, of watching some of her very early performances at several Greenwich Village night clubs - the Bon Soir and the Blue Angel - pre recording days, when she was a virtual unknown. This sort of experience, especially with a singer of Streisand's stature, can - and did for her - feel like a magical discovery. Personal too. Like having insider knowledge of a great, yet-to-emerge talent. She then lamented that, when Streisand made her first appearance on The Tonight Show with Jack Paar in 1961, it was officially spoiled. Now millions of people knew about her, and the bloom was off the rose. It's funny how stories can stay with you like this for almost 50 years, but I know that they stay - or don't - for a reason. Before I even began selling books thirty years later, in the 1990's, I already knew the importance of early. The "I-knew-her-when" principle applies, you see, in so many bookselling areas as well, and early doesn't necessarily have to be good to be valuable, as long as what followed was. Take Hemingway. His first publication in book form was Three Stories & Ten Poems, issued by Contact Publishing Co. in 1923. The intrigue of early is big for most of us, and author's first books are with comparatively few exceptions their most valuable. 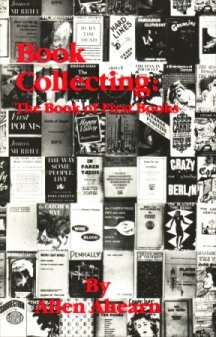 One of the more useful books in my reference library addressing this is Allen Ahearn's Book Collecting: The Book of First Books. In the introduction Ahearn writes, "I operate on the premise that the first edition of the first book often sets an upper level on the value of an author's first editions ..." There are approximately 3,500 author's first books listed in this book. Last published in 1986, the quoted values are somewhat more modest than what prevails in today's marketplace (Three Stories & Ten Poems is assessed at $5,000, for example), but the usefulness of this resource lies primarily in identifying the most collectible authors - many of those that we booksellers should be looking for in the venues we shop in. Staying with the Hemingway theme, books about an author's early years are often sought after more than their much later publication dates would seem to justify. Hemingway's autobiographical A Moveable Feast, for example, written late in the author's life, features sketches of his early Paris days, and First Editions do remarkably well despite large numbers of them in present in commerce. Also, if you've read Carlos Baker's Ernest Hemingway: A Life Story - an exceptional biography, by the way - you may have noticed that the most captivating portion of the book deals with those very early Paris days and all that Lost Generation jazz and pizzazz. Baker himself seems to relish writing about it. 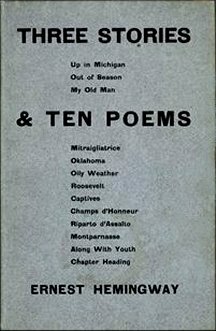 More Hemingway: Several years ago I had the good fortune to happen upon a 1917 Senior Tabula at an estate sale - Hemingway's Oak Park High School senior yearbook and more notable yet for publishing one of his earliest pieces, a class prophecy, and containing several early photos of the author. Needless to say there was significant interest in this, well north of four figures. And this brings up a significant, more general point that perhaps is best illustrated again by something specific. Last year I came into possession of a ca. 90's signed book by Jim Nabors, AKA Gomer Pyle of Andy Griffith fame, and his high school yearbook with no signature in sight and only one small photo. Which do you suppose did better? By a factor of five, the yearbook - because it was early. As some of you know, I stock and sell yearbooks by the hundreds, and the listing process always begins with an investigation for celebrities for this very reason. Appearances of early articles, short stories, excerpted or serialized novels, etc., in magazines and periodicals can also pay off nicely. A few notable examples include Edgar Allan Poe, P.G. Wodehouse and J.D. Salinger, but there are many more worth bothering with. And again, listing any magazine or periodical should always begin with a perusal of the table of contents. These are but a few examples of what can deliver good profits on "early" material, and many more will come your way if you cultivate an eye for it.